Multiple sclerosis (MS) is the most common chronic inflammatory-demyelinating disease affecting the central nervous system (CNS) of young adults in the western countries, leading, in the majority of cases, to severe and irreversible clinical disability (1). Since its clinical introduction, conventional magnetic resonance imaging (cMRI-dual-echo and postcontrast Tl-weighted scans) has greatly improved our ability to diagnose MS and to monitor its evolution, either natural or modified by treatment (Fig. 1) (2). cMRI-derived measures have indeed shown several advantages over clinical assessment, including their more objective nature and increased sensitivity to MS-related changes. Nevertheless, the magnitude of the relationship between cMRI measures of disease activity or burden and the clinical manifestations of the disease is weak (3,4). This necessarily limits the role of cMRI for the understanding of MS pathophysiology and monitoring of experimental treatment. 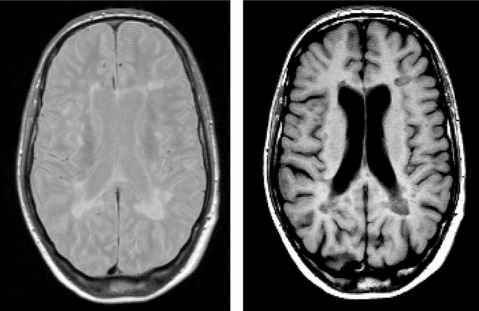 Figure 1 Axial proton density-weighted (A), T2-weighted (B), and postcontrast (Gd DTPA, 0.1 mmol/kg) Tl-weighted (C) magnetic resonance images of the brain from a patient with multiple sclerosis. In (A) and (B), multiple hyperintense lesions, suggestive of multifocal white matter pathology, are visible. In (C), some of these lesions are contrast enhanced, indicating the presence of a local blood-brain barrier disruption. 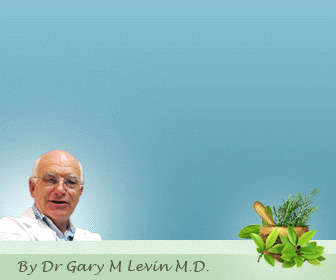 Abbreviation: Gd, gadolinium. (13-15) and which is likely to be associated to some clinical manifestations of the disease, such as cognitive impairment and fatigue. 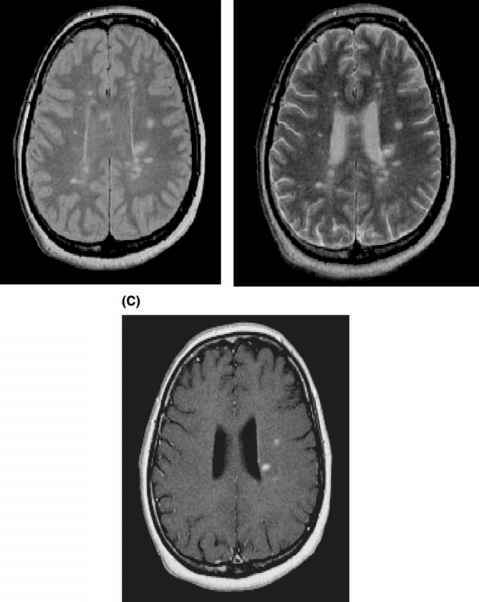 Figure 2 Axial proton density-weighted (A) and T1-weighted (B) magnetic resonance images of the brain from a patient with a secondary progressive form of multiple sclerosis. In (A), multiple hyperintense lesions are visible with a predominant involvement of the periventricular regions. In (B), some of these lesions are hypointense (''black holes''), indicating that marked tissue destruction (demyelination and axonal loss) has occurred. and recovery from sublethal axonal injury. Finally, functional MRI (fMRI) holds substantial promise to define the role of adaptive cortical reorganization with the potential to limit the clinical consequences of irreversible MS tissue damage. The present chapter outlines the major contributions obtained by the application of cMRI and modern, quantitative MR-based techniques to the diagnosis of MS and to the understanding of the factors leading to the accumulation of irreversible disability. The main results obtained from the application of MR technology to monitor MS clinical trials are also discussed. These paragraphs are preceded by a brief review of the basic aspects of nonconventional MRI techniques to provide an adequate background to those readers who are not MRI specialists.